The “pop-up” day of mourning for departed President George H.W. Bush provides us an opportunity to ask a few very pertinent questions. Elsewhere, we read that the last time the passing of a President resulted in a national day of mourning was January 2, 2008 when George R. Ford passed. The closures frame an interesting social problem: How American’s deal with death. My visiting consigliere noted that he’s been to an increasing number of funerals lately – since he’s part of the “gray wave” of Boomers we’re in, too. The social reality problem is more political in nature – and I hate to be rude, but someone needs to ask: Since Bush was a republican, couldn’t democrats show up and work tomorrow? See: America’s sociopolitical landscape has always struck us as a bit odd. When Dr. Martin Luther King, Jr. Day rolls around, the sad reality is very few people remember the fine works and lofty ideals. Instead, it’s a “day off” or the plagiarism discussion makes the rounds. National Holidays seem in board decline: I may be one of the few citizens who calls military people I know on Veterans Day to say “Thank you for your Service,” too. You mean the Fourth of July isn’t National jet ski day? That fact alone, plus the “rush to close” places like the U.S. Supreme Court, reminds us uncomfortably of the great schism between the working class tax payers and the ruling class tax spenders. Tomorrow appears to be a “ruling class” holiday and we wonder if the Elder Bush would have endorsed that? As long as we’re picking at the news flow today, let’s have another reality check, shall we? Well fine. 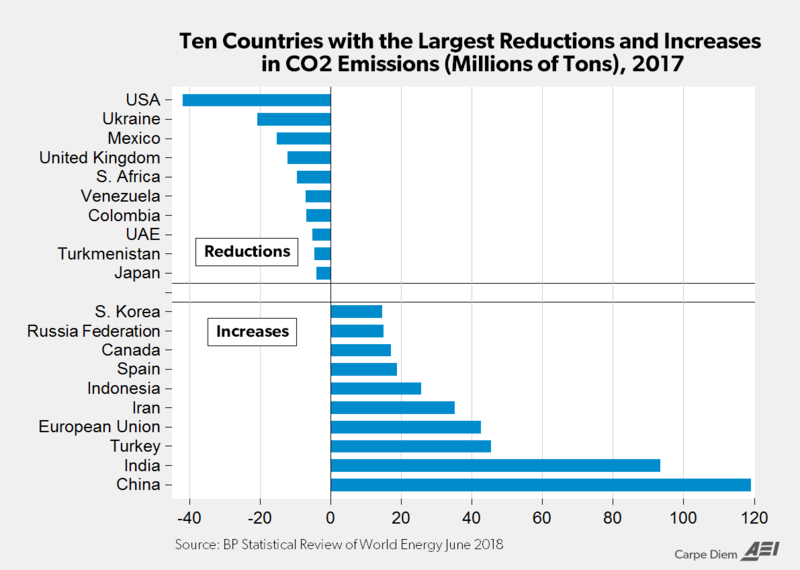 Except for one small detail: When you live the life of a data monk, you stumble on inconvenient Truths – like the fact that the U.S. has already done more to reduce its natonal carbon footprint that any other country in the world. And not by a small margin. In fact, in the data summary chart here, you’ll see that the U.S. last year reduced carbon by 42-million tons. But, the slick-talking European socialist effete club (the Ure-a-pee’in Union) actually increased its carbon dumping by 42 million tons. Who needs to sign WHAT? Well, d’uh. That’s what I’m telling you. But this is all because there is something else going on, in case you didn’t read Daniel Yergin’s “The Commanding Heights : The Battle for the World Economy : back when. Understand this well: There is a data driven Reality and there’s the social fun-house mirror version. One’s scientifically “real” and one is a monetization. Take the riots in France, for example. On the week of rioting, the Wall Street Journal’s editorial board explains it as a “global carbon tax revolt:” and explains that “The French are the latest to refuse to sacrifice growth for green piety.” Quite so. Thus, the battles to watch are “in the valley” where reality is less obvious than it is along the ridges at the top data levels. Digital Mob Rule is getting a foothold. It should be in your face in 2019 here in the USA. For the longest time in this country, we had a “semi-honest” mainstream media that was given “custodianship” of reality by the powers that be. But then came Donald Trump – wrestling away control by going consumer-direct via Twitter and doing lots of White House Live direct feeds. It’s there because the former “custodians of “agreed reality” (which differs widely from data reality) want their power back. Old media is dying hard. They’re wishfully writing about getting the genie back in the keyboard. While our main emphasis around here is on long wave economics – and how the present bottoming of interest rates – and the Fed’s too-fast raising – may crash the system, we also enjoy a good round of Staying Grounded in a world that’s flipped out. You can see how their gingerly handling of rates (and intraday easy money) plus the international picture, is (so far) floating markets past the collapse inflation point. The Valley of Financial Death – the replay of 1929. See the yellow line in this chart? ADP Employment data has been pushed to Thursday. Fed Boss Jerome Powell’s testimony for today has been cancelled, and we won’t see expected Trade and Productivity data until Thursday now… No idea if anyone will come in and release the Red beige book this afternoon. As far as we know, the federal unemployment data will still drop Friday. Pappy’s right, of course. Look what war with the U.S. has done for European and Asian countries and ask would England or Germany or Japan be where they are today without a U.S. conflict to school them? Methinks nay. And we spend money on the damnedest things. For example “People drink twice as much alcohol over the holidays, survey finds.” You mean people didn’t already know that? And, just in time for your Christmas shopping, here comes CNN with “Bombardier Global 7500 vs Gulfstream G650: Battle of the private jets.” You’ll need a bigger tree. Here’s yet-another reason to “code your passwords:” Quora says 100 million users hit by ‘malicious’ data breach. Coding is simple: Just add a prefix, suffix, or somewhere in the middle where you plug-in a few letters of the site you’re setting up for. If your password was something like “example” a Quora coded password might be “qpassword” or “examplequo.” Even “passquoword” embeds it. Key thing is you only want a password to work on exactly ONE SITE. What makes data breaches work for the slime that do ’em is they are easy. You port an email address in as a “user ID” to a largish list of banks and brokerages and port in the passwords and you might be able to do some digital pilfering. Run macro, wire money to a shadow bank, resell the hacked list on the dark web… rinse and repeat. The addition of a coding of passwords let’s you know when there is a breach like this, it’s time to change and recode all your other passworded sites. Bonus: In terms of data breach liability insurance (huge growth area in the insurance field in general), if you employ site-name specific passwords, the fiduciary responsibility is readily established. 90-minutes to the open, futures were down 117…BTCs $3,966’ish. not unexpected given the craps tables will be closed tomorrow. OK, off to breakfast and then to work on Peoplenomics charts for tomorrow’s report…. Boy, I sure do not know who this person is who has sent two rude posts accusing me of stupidity, but he or she is certainly mad that Hillary was denied the US Presidency. I never even mentioned Hillary in my posts. I am relieved that she lost, however, that sentiment may be short lived. With all the progressive Democrats, also known as Communists light, who have been “elected” to office, the political situation next year could very well make America a socialist country. Then, onto the slippery slope of something much worse, besides the world we now live in that has higher taxes, more crime in our cities, and the rule of law trashed. I do not think that the American people truly know how horrible it could become for us all. I apologize – on behalf of readers who don’t respect our ad hominem (and ad howimmen) attacks. To the person who wrote disparaging remarks and accused me of being on social media, reading posts by Russians, and living in a Duck Dynasty rural area, who kicked over your rock? I have never been on any social media, and I live in a mountain community in New Mexico. New Mexico is a blue state run predominately by a strong, old Hispanic community. To the person who said that Hillary won the popular vote, Hillary did NOT win the popular vote. Your comment that I am in denial about that is wrong. Are you counting all those votes for her that were discovered to be fraudulent? I’m sorry that you don’t have 4th grade arithmetic skills. 66 million (a rounded up figure) minus 63 million (a rounded up figure) equals around 2 million+ popular votes that Trump DID NOT HAVE. Check the Wiki link I provided. Please provide a link proving your fraud claim, or continue in your fictional tirade! Thanks to Andy for a very good post. I told folks back in August of 2016 that Trump would be elected President by a landslide. They all looked at me in great surprise. It’s a landslide if you stay in denial of the 2 million popular vote surplus of Hillary. But, hey, use social media propaganda posts (authored by Russians), in provincial areas where Neilson ratings for Duck Dynasty prevail, and you’ll get all the racists out of the closet, normalizing the polarized attitude. Good data mining from Cambridge Analytica! Sheeping the people like nobody’s business!! Putin knew who he wanted…. I agree that Andy wrote a ‘slam bang’ contribution!! I also did some research into FED activity some 70 years ago, and at that time I’d reached my conclusion that w/o them and the banks, World War One wouldn’t have been possible. Too bad people are so naive! Thank god UPS will be running tomorrow. I’m expecting a new AR15 upper and can’t wait. This will be my FIRST piston version and should run cleaner than my DI examples. A different type of Mourning…The Dow is down 800 points. That’s huge…And it’s all because of the smoke and mirrors that Trumps creates. Once the smoke clears, the people paying attention realize that they have been hoodwinked and retaliatory sell offs like today occur. According to Trump…China and the US resolved…at least on a temporary basis, their trade differences…but upon closer observation, the tariffs remain and Trump is his infinite dumbness paraphrased with apologies to the Beatles, “I am the Tariff Man”..
Another reality is that people everywhere feel that Trump is on trouble with Mueller. While that makes a majority of Americans very happy…the reality is, as George has said many, many times…markets react to the news. Initially, his possible indictment or whatever it becomes will spook the markets with uncertainty. History is making it a point to be nervous…While there was already ongoing bear market activity going on back during the 70’s… From January 1973 through August 1974 — a period that includes the conviction of the Watergate burglars, Nixon’s resignation, global oil shock, Middle East turmoil, and a dramatic spike in inflation — stocks lost 42% of their value. Today, we have Russian/Ukraine turmoil, diminished global oil prices, Mueller investigation bombshells on the cusp of being revealed, a record high national debt, a trade war, a crazy man in North Korea, a Senate stand-off with Trump and Saudi Arabia over Khashoggi…etc. A lot of Rhymes going on. I went to a cash position this morning just in time…But what will tomorrow bring? Crazy times. The majority of Americans – especially thinking Americans, are not happy about any possible success for Muller. Anything that guy does with any real effect will destabilize us economically and potentially geopolitically. Whether or not you like President Trump, he is the president and will likely remain so for at least a year or two, perhaps much more. It’s best to work with our chief executive rather than fighting him at every turn. He won’t back down on things that really matter, and I can’t even imagine a president Pelosi. Even that thought is enough to cause vomit. This kind of infighting can lead to a civil war. Just observe France. I, for one, detest drama and anyone trying to change me or my lifestyle. Having adapted to living comfortably where I am, I don’t want rapid and unreasonable changes in government and its direction, even if I could make more money that way. Mark, I agree with your positions many times, therefore, allow me this question: Did you have a problem with parental authority while growing age 1-5? Your hatred for DJT maybe displaced, perhaps? In reality, I have never met, at least in person, anyone that likes or supports Trump. I do know people that voted for him, very reluctantly .Hillary was a horrible choice for a lot of people..even here in the Bay Area. As you know I wasted my vote on someone else. Actually, My hatred is not at all displaced…I am the norm…at least here in the Bay Area/Silicon Valley. In my world, it is the Trump supporters that are displaced. So as I have posted before, markets moved based on capital inflows(storage) and outflows (consumption), do you think that todays movement is simply the fact that is the day of giving that was created in the recent past? People move their capital out of the markets to give to a charitable organization – the massive sucking sound of capital being pulled out of the markets to be donated, just might have caused the near 800 point drop today. tRump is a buffoon, but the replacement is much scarier, imo.. With tRump, everyone is up in arms about everything he does, and no good can come from him. Next man up is Pence, not Pelosi, unless Pence is impeached also. While tRump does things erratticly, Pence would probably be much akin to Clinton would have been a deep state smooth talker that causes war to save the economy and eliminate many of us humans, as out overlords have a difficult time controlling this many of us. Hey, this is all no suprise to those of us who are aware. Time and time again, i referenced my post (i wont do it again) where i clearly stated (before Trump won the Republican nomination) that he would go on to win the presidency. That there would be a period of perceived prosperity for 2-3 years and he would look like a savior to many. All of that had unfolded as was stated. In the end Trump be a scape goat. Left holding the bag. Which is now unfolding again. I also clearly stated that Joe Biden would run for president in 2020 about 2 years ago in the comments on this site. I actually have the info through meditation on who is VP pick is. I just need more time to dijest all the info provided. So, all of this you were told. Clearly! This should be no surprise to anyone. At all. I know, i know its hard not ti get emotionally attached to the dilemma’s that our country faces every day. Because you are emitionally involved by the romance of it. However, if you emotuonally detach!!!! From all of it, and see it as just data??? You can make better financial decisions and manuver and plan accordingly to secure your position in prosperity. Its no different than looking a couple miles down the toad and seeing the breal lights on the free way and taking the first exit and taking an alternitive rout. No differnt. Oh the bridge is up, instead sitting like every one else for an hour till a boat or barge goes through, you tale the exit and a side street and by pass all the confusion and get to your destination by avoiding an accident or a long wait. Make no mistake!!!!! The current bubble we are in was not developed nor created by Trump! Trump is just going to get the balme for it, when it bursts. Thats for cetain. It happed on his watch. He is the perfect scape goat. Ye is a 1% er a rich dude. And all those people/the middle class when they loose everything again and big walstreet guys are taking million dollar bonuses and corpetate presidents getting 60 million dollar salaries??? Ots gonna be bad.. look soon for some news to come out about Trump and making huge profits and lots of money… it is the set up! Anyway, THIS BUBBLE, It was created in 2009 when Obama took office. Now Obama is not its creator either, but it did fall under his watch. THE FED, created this bubble! Lowering interest rates and doing HUGH bail outs. 2 of them One under Bush Jr for 700 billion and another Under Obama for an additional 700 billion dollars. Repeat after me. FED POLICY CREATED THIS BUBBLE. I think Trump is a like able person. Lol id totally hang out with him and have a beer. He is not the source of this financial mess we are in. THE FED is and greedy corporations. The Bankers control all the money. this is their creation. IF YOU think this has anything to do with Trump? You are sadly decieved. Im let ya in on a little secret. THE FED, is a private organisation made up of bankers. It is not part of the government. They control the money. They make and can break an economy. Not the President. Also FYI: NOBODY, REPEAT NOBODY, goes to war without Finaicial Backing From the BANKS. Not the US, Not Russia, not The Ukraine etc etc. Etc. FIRST! all wars are financially assesed by those who have the money!!!!! I know this is a hard thing to grasp. BUT all wars, and who wins are decided by the Banks. Not by the muscle. Sure The US has the baddest NAVY and all the state of the art militaty gizmo’s. BUT movement of military and logistics of war, is a finaicial nightmare and the banks fund all that. IF the plan to go to war in say the Ukrain is out in the open now???? It was formulated as a plan 6-9 months ago. Just the cost of fuel, water, food, troop, movement, suppy of amo, tents, sleeping bags and socks and boots for that matter, is all Decided FINAICIALLY long before on Hummer gets in line go get fuel to road trip off to war. I was in the first desert storm. I knew in august we were going to Iraq in January. The rest of the world found out in decemeber of that year. And i wasnt high up on the list to know more than that. I did see orders about supplys and reciving amo on the air craft carrier i was on that seemed peculiar 9 months prior to ever going to desert storm. We took om way more amo and bombs tha wer normally do, alot alot more for war games etc. (i was at the time, in charge of military transportation, the air transfer officer, and supply on an air craft carrier) 9 months prior to desert storm. Make no mistake Mark! All wars are planned a year to a year and a half prior to them becoming public knowledge. Its not like you can just make a phone call and move 20,000 troops within 24 hours to go fight another country. The world doesnt opperate that way anymore. If you are seeing it on the news???? Thats a year 9r 2 later info. And all that Planning FIRST gets accepted and approved by the Banks financially a year (or longet) before one bullet is fired or one ruck sack is thrown in a Hum V.
The recent sell off is part of a controlled demolition. If you dont see that? I dont know what to tell ya. you have to think outside the Box Mark. I know you are smart. I actually like you. Stop bashing Trump. You are blaiming the wrong person. Thats who they want you to blame! You are being played! That is the big Con, the big sell to the American people!!!!!! Thats the scape goat. Thats who they want you to blame. SO those who actually created this mess. Can walk away and not be held accountable at all. God i hope i get through to you! Despite the run-on sentences, spellings errors etc…which I am known to do as well…you did get through to me. I know the Fed is ultimately the Grand Poobah of Planet Earth. Here is the truth… No President has ultimate control. Some can inspire…some can create a Morning in America mood…or Hope…or a New Deal. But you are right…the Bankster class…worldwide, not just America, is in charge. In the same way..knowing that the Bankster class is in charge….What I don’t like is the insistence of those that support Trump that he is the second coming. I am really dumbfounded by those (Fox News) that think this ignoramous has a clue about anything. He doesn’t inspire, he doesn’t have a plan, he doesn’t bring us together…he is a divisive, angry old coot that is in love with himself and only himself. So…I will stop bashing Trump…when people stop,praising him. Well duh Mark. Thats what Fox news is paid to do. Be the cheerleader for the Republicans party. Plus he is the perfect scape goat. Not one single person of middle ground intelligence would be stupid enough to take that office after Obama and the on going Fed Policy for the last decade. Its like playing russian roulette with every round chambered but one! So they stacked the deck, and played long on ego and pride. Mixed in some image and self centerd agrandisement. Whalah!!!!!! magically it worked! I can hear the conversation in a private room at an undisclosed hotel location now! What we need is a self centered, ego mainiac, who is also rich. Yet, Someone who can also be so beligerant the common core beer drinking hillbilly with biib overalls and a pocket full of zip ties could relate to. Someone who we can sell to the public like a fat roll of duct tape. Nobody hates duct tape and nobody uses duct tape for actual ducts! In Fact! everyone in the entrire united states down to the child who is 5, has acccess to and will use Duct tape on dam near anything. We will run him on the campain slogan “git er done!” Nah mark that maybe to hillbilly, how about this? Make America Great again. How does that feel to ya??? Wow John, that totally says “Git er done” but in the same breath its patriotic as F! Nobody is gonna go against making America great. Not even the dems can slam that one. Its perfect!!!! Then a long silence…. hmmm where do we get a guy who is just like that. Ego so big his brain wont be able to process the impending doom in the next 3 years??? Another long pause…..then mark turns on the TV, and what do you know the first thing that comes on? An Apprentice re-run. They both look at each other, marks got one tear streaming down his face and the bigges cheshire i ate the putty tat grin ya ever saw. John nodds his head almost speechless, and utters the word to seal his fate, bingo! And they both burst into laughter. And 3 months later Donald Trump announces his candidacy. Anyway, i kinda imagine it went down. something like that. Lol lol excuse me..its a natural cycle…at this point we can not alter our path.. But..I am totally for green living and green building.. To reduce carbon emissions and filter the atmosphere..instead of consuming farmland build so that crops still can be produced. I forget which year it was but a short time ago we reached the.point where we could adequately feed the population of the planet. A couple of crappy crop years and it could get ugly. I personally think that’s why there’s a race to occupy other planets..
Because we can’t support the planets population is also why I think there will be a mass culling.. I hate to be rude… But in the real work a day blue collar world there aren’t any federal holidays..
Not since deregulation in the early eighties.. The last Christmas that I remember that everything was closed was the year that the cabbage patch dolls were introduced and the retail store I worked at was going to be the first to open for a half day on Christmas eve.. I pre planned my funeral service..there won’t be a traditional service just cremate me.if someone wants to see me they can while I’m kicking. I didn’t want an obit they insisted.. So I told then he decided to take a long vacation and hopes there will be.moderate temperatures there..anyone that knows me will realize I’ve never had a vacation and inquire if the family wants head to chicken ranch and get a keg ..if I know that I have a terminal illness then I will host a wake have funeral beans and funeral meat sandwiches on one table on the other some real food..why should every one else have the fun when I won’t be around to enjoy it.. In the end you leave nothing..when my mom passed on every doctor in the rosters sent a consulting bill.. Sometimes, I may have expressed myself negatively in the past about my compatriots, however, look at what’s going on in life ;-( and the stockmarket in particular. Do most of these people deserve to vote? Please!! P.S. People seem NOT able to grasp the obvious. I don’t consider H.W. a great president at all. Reagan did far more for the country. When I think of H.W., I remember “no new taxes”, and a stupid Gulf War. Lots of palace intrigue, and someone that spent his life as a second stringer. He only got to senior status when his competition died off. If we’re going to have a day off(and it’s only the government types that have one), then celebrate someone who contributed(like Stephen Hawking), or a great beauty(like Marilyn Monroe), not yet another flunky politician. Maybe even a great builder, like Cornelius Vanderbilt. It’s just another day cut out of a lame duck period, I suppose, and one day less to get your Christmas presents mailed. Regarding “Crimate Change”, I’d be much less concerned about CO2 than O2! I’ve noticed that wood burns less easily here than it used to – and that could be for many reasons. If we burn carbon(oil, coal, whatever) and sequester the CO2 – either underground or elsewhere, we’re essentially sequestering our oxygen too. We’re still clear cutting the equatorial rain forests and killing off plankton in the oceans, so what are we supposed to breathe? Massive wildfires and volcanoes certainly don’t help. Of course, I mustn’t think about these things or someone will call me a “conspiracy theorist”…. We have smoke alarms and CO2 alarms in every department store, but no consumer level O2 level meters for home use. I need to find and buy one. It can stay always on next to the radiation monitor. Robert.. I really liked Ronald Reagan..he to wasn’t a politician and I think he truly believed what he was doing was the right thing. Looking at it from his perspective he was assuming that if he got the issues addressed that those receiving the benefits would react like industrialists and leaders of the decades when he grew up and would do the right thing. What he wasn’t counting on was how deeply embedded the puppeteers were in our political system and how much control they already had on society. Hi mike.. If anyone was serious about co2.. Green building.. Give everyone a small flat window aquarium with the bottom made as one solid air stone..fill it with in treated water and have an adequate airpump.. A guy could even have plants above..sort of a deep well hydroponic..let the algae grow..like duckweed harvest some of the algae..( which can be processed into various products.alcohol and.oil being some of them) a two litre algae farm will absorb somewhere around thirty pounds of co2.. I think.. I’m no scientist or anything just a guy looking at it from a different angle. That’s the information most people rarely get to hear. LOOB, Earth is an ecosystem, with the emphasis on ECO. We (not just humans, but ALL animal life) exist because of a balance between temperature and oxygen. We survive because of a balance between plant life and animal life. Plant existence is actually more complicated than animal existence. Plants not only require a balance between temperature and carbon dioxide, but also the presence of nitrogen, phosphorous, and potassium in whatever soil they find themselves existing. Phosphorous and potassium are provided by decaying tissue which was formerly living. But I am concerned about expansion.. We are building at such a rate and the land where they are building is the land that was once prime farm land. The only option I can see is the promotion of green building..
Twenty years ago I worked as an alarm monitor for a major company – and got ‘prize money’ for dispatching the authorities on ‘actuals’ – I got some extra cash for catching a CO2 alarm at a residence. Not sure of the make though . . .
There’s an interesting tier of journalism emanating from the secretive Caribbean volcanic island of Nevis, birthplace of Lord Nelson’s wife. A scathing blog, order-order dot com for instance, published last month that rebellious English MP Jacob Rees-Mogg had been disinvited from addressing a dinner gathering of the ruling Conservative Party Headquarters group and its large donors. The disaffected Irish blog writer has paired up with an opposite thinking Anglo-Indo associate, and between them they have set up a service that hosts other blogs of convenience from the allegedly difficult-to-sue citadel of Nevis. Interestly the Anglo-Indo partner was the IT brains behind Mrs. Clinton’s presidential run. Add a tot of rum to your coffees, laddies and lassies, and enjoy the fireworks from deck chairs in safe havens. Keep your powder dry. There be Jolly Rogers about. For the last several weeks followers of Q have been interpreting his cryptic messages to indicated Dec. 5 was a key date for the MOAB (mother of all bombs). Comey was scheduled to testify to Congress behind closed doors so he would have to answer classified questions which he could have dodged if it were a public hearing. IG Huber was also scheduled to testify on irregularities of the Clinton Foundation, but now it is all conveniently delayed. Quirky coincidence or Deep State desperation? Bush 41 was an important minion of the overlords so he gets a big send off. HW was leader of the Deep State, not that different from a mafia don (kiss the ring). I can’t get why people are applauding him. And I don’t remember a “George” R Ford (LOL). No, OCF got the terminology correct. He was a minion. He’s an off-center fed dipole? The tone of that SJ Merc piece, about the fire conspiracies.. I had to read it twice, it’s written like a 7th grader wrote it. Me thinketh they protest a bit too much. If I was paid to help squash rumors about such conspiracies, I’d write a goofy piece like that too. In other words, I left thinking the conspiracy folks may be onto something, where there’s a barking dog there’s a fire, right? Of course old man Bush would of endorsed a day off so people could pay tribute to his memory,after all one of that class loves to be remembered, much like the boss of a mob family where you see all the other mob families line up with a million dollars worth of flowers just to pay him tribute,but then again if you look at his dark side the thousands who died in Iraq because of the destruction of the water plants the electrical power plants, medical plants,his involvement in the release of the hostages which involved millions in spare parts and weapons for Iran, Iran Contra then you get a different view,one that makes one wonder just where do all those/these despots come from…. Robert: Good post. He never understood what the common man was about…assumed everyone had a life like him. “According to Otto Skorzeny, pictured is the Scherff family and a few friends (circa 1938). Holding “Mother” Scherff’s hand at left is Martin Bormann. In front is Reinhardt Gehlen. In back is Joseph Mengele and to his right is Skorzeny as a young man. thanks anon.. I have never seen that one before I had read some things.. knew a guy that was a guard at the depository once that told me there were things in the vaults you wouldn’t believe were here..and the suspected that they were sent over to the us by germany before the end of the war..
Re: the profitability of war – The Corbet Report’s three part series on WWI is a real eye-opener in terms of who profited and why from the first big war. Sure, Mr. Corbet’s an anarchist but I’m not totally sure he doesn’t have something worth considering in his philosophy given the Elites’ views on us all being their cannon fodder and livestock. I can easily see how all the major wars following WWI were fomented by behind-the-scenes manipulators to this very day and until everything finally falls apart. If you are talking about Cheney – he looks pretty good for someone who doesn’t have much of a heart – literally! Frankly ‘wars’ (most anyway) set up resentments that lead to other wars – re ‘WWI’ (which wasn’t the first world war) – look up the Franco-Prussian war and the Crimea war . . . peoples get ‘notions’ about being dominate . . .
Colonial rivalries (money) definitely played ‘a’ role in WWI. Competition over control of various colonies in Africa, Asia and the Pacific led to some rather unseemly alliances and simmering tempers. With tensions growing, all it took was one well lit match to ignite a massive conflict, that being the assassination of Archduke Ferdinand by a Serbian nationalist. Austria-Hungary quickly declared war on Serbia. Russia announced it had Serbia’s back and declared war on Austria-Hungary. Germany declared war on Russia, then promptly invaded France and Belgium. This all led England to declare war on Germany. Late to the game, U-boat attacks on American ship supplying England with arms and good brought Uncle Sam into the fray. Up until this point in history, the U.S. was quietly focused almost entirely on the W. Hemisphere. WWI was the nation’s global “coming out party,” demonstrating to the world its industrial capacity and military might. Warhammer … Sir (or do you work for a living? I’ve forgotten), with utmost respect – I will be more than happy to consider the thought that Mr. Corbet may very well be a somewhat low-level agent provocateur given his unabashed admission regarding his political standing in past videos he’s published from his home in Japan. While I have a considerable amount of curiosity regarding true history (it’s always much better than fiction) I’ve never studied it on any coordinated level that would approach what I suspect you probably have. If Mr. Corbet’s video report is severely flawed in any way I, and probably others here, would hang on your every word. Reminder to self, re-read The Report From Iron Mountain to put things back into perspective.